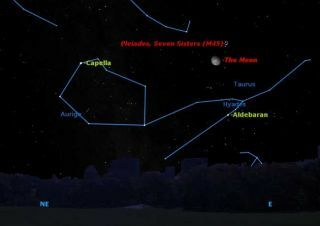 The moon pays a visit tonight to the Pleiades star cluster, plus the bright stars Capella and Aldebaran. Take a look to the east around 11 o?clock your local timeWednesday night, and you?ll see a pretty sight. The rising gibbous moon will below in the eastern sky. Look closely just above it and you?ll see a smallcluster of stars, known as the Pleiades. It is a great opportunity to use the moon as a marker tofind a gorgeous sky scene you might not otherwise notice. To the naked eye, the Pleiades appears as six or sevenbright stars in a slightly hazy looking group. If you look more closely, withbinoculars, you?ll see the reason for this ?haze? : a number of fainter stars,too faint to be seen as individuals. The Pleiades is the brightest and best known star clusterin the sky, located 410 light-years from the sun. The six or seven brighteststars, visible to the naked eye, form a miniature ?dipper.? In ancient times,these were seen as seven sisters, and figure largely in many myths around theworld. In Japanese they are known as Subaru, and form the logo of a well knownautomobile manufacturer. In modern times, they are sometimes called ?theShopping Cart,? after the vehicle we see in every supermarket. These stars share a common and fairly recent origin. Thegaseous nebula from which they formed has now dissipated. On very dark nights,wisps of nebulosity are visible around some of the stars, but this is lightreflected from a nebula they just happen to be passing through, not the nebulawhich gave birth to them. Just below the Pleiades is another open cluster, theHyades. This cluster is only 150 light-years away, so the stars appear morewidely spread across the sky. Although the bright red giant star Aldebaranlooks like a member of this cluster, it is in fact less than half as far awayas the Hyades proper. The Pleiades and the Hyades are both part of theconstellation Taurus, the Bull. The V-shape of the Hyades forms the muzzle ofthe bull, with Aldebaran as its glaring red eye. The Pleiades ride on theshoulder of the bull, kept safe from the unwanted attention of Orion theHunter, whose bow is just peeking above the horizon below Aldebaran. If you look off to the left of the moon, you will see thebright star Capella shining in solitary splendor. It forms one corner of thepentagonal constellation Auriga, the Charioteer. Along with Aldebaran it is thefirst star of winter, soon to be joined by the other bright winter stars ofOrion, Gemini, and the two dogs, Canis Major and Minor.